My school has started sending out messages each day describing the day’s lunch. Once translated, it is probably more confusing than not knowing at all. “Please note that from meals room>1. Food and Health News No. 4 exit. (“Stress too hard come harderchungonjeung received”)2. Today, my kids are too like boiled. Suddenly you’re feeling better this year for things to “loin” was prepared. Please enjoy delicious.3. Lettuce, carrots, cucumber prepared by Eco. May worry that you have folded like sigo. To eat plenty of vegetables and fruits, especially in the spring. (Chungonjeung Prevention)4. Talking theology students have a lot of changes in the amount of pear is often lacking. I wasn’t sure what we were having until I walked into our lunch room and it all made sense. Up until today, I hadn’t taken pictures of any of my school lunches because I was pretty sure I’d look silly doing it in front of all of my fellow teachers… but the interesting thing about a new school year is that half of the teachers I have lunch with are new to my school (teachers in Korea rotate schools every 2-3 years). None of them know me or talk to me (only about me) so I decided to go for it today. Across the top is boiled pork (수육), dipping sauce (쌈장), water kimchi (물김치). Across the bottom is rice (밥) and lettuce for wrapping (상추). They also served soup, but I rarely ever eat it because it’s usually fishy or made with some sort of fish based broth and I don’t really care for seafood. This lunch is like a treat for me. There’s a good mixture of protein and vegetables, which is usually lacking in the lunches at my school. 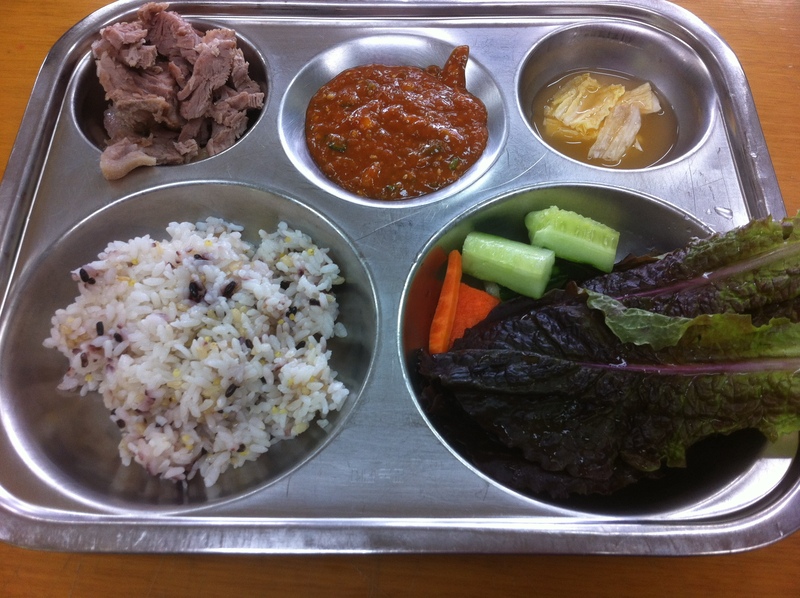 The lunches at my school aren’t that amazing and occasionally I find myself only able to eat the rice and kimchi (if it’s good that day). This entry was posted in Korean Food, Teaching English in Korea and tagged Busan, English teacher, EPIK, ESL, Korea, school lunch, TEFL by Meagan & Dave | HappilyEverExpat.com. Bookmark the permalink.